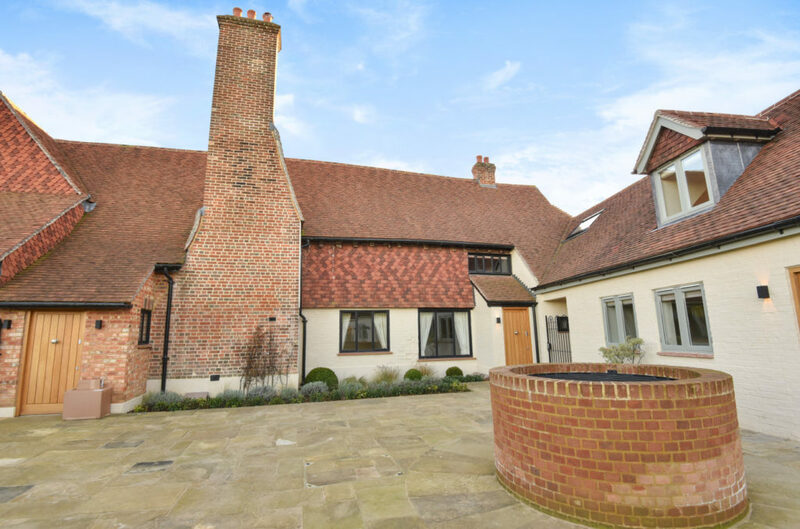 A Delightful Two Bedroom Newly Refurbished Character Cottage Located On The Holdhurst Farm Estate Close To Cranleigh And With Direct Access To Public Pathways And Bridleways. 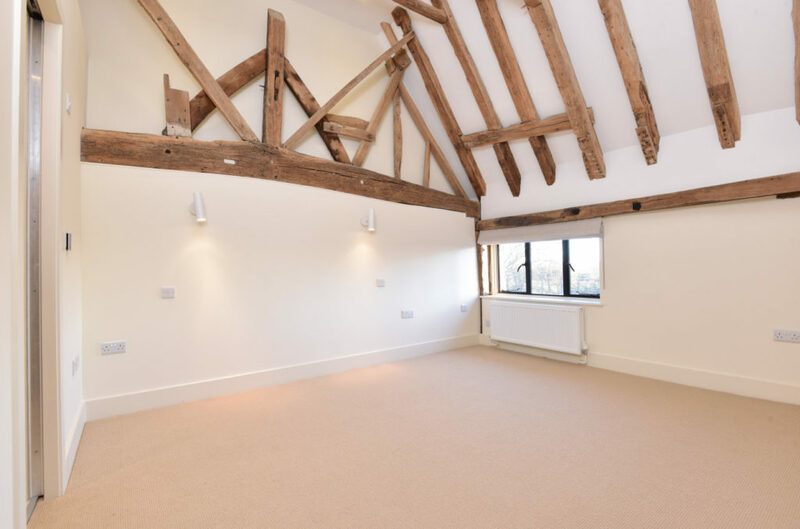 Location: Holdhurst Farm Estate is a short distance from the centre of Cranleigh village, lying at the foot of the Surrey Hills and therefore a haven for walkers, horse riders and cyclists. Cranleigh High Street benefits from two independent department stores, M&S foodhall and a collection of restaurants and cafés. Cranleigh Arts centre has a full diary of events to suit all tastes. There is also a leisure centre, golf and country club, medical centre and library. The regional centre of Guildford is 10 miles north, offering further shopping, business and cultural facilities. Road and rail communications are readily accessible with the A3 providing access to central London, the M25 and airports. Mainline services to London Waterloo take from 35 minutes. Description: Cottage 1 is a two bedroom character cottage that dates back to the 15th Century, there are many exposed beams and bedrooms with faulted ceilings. 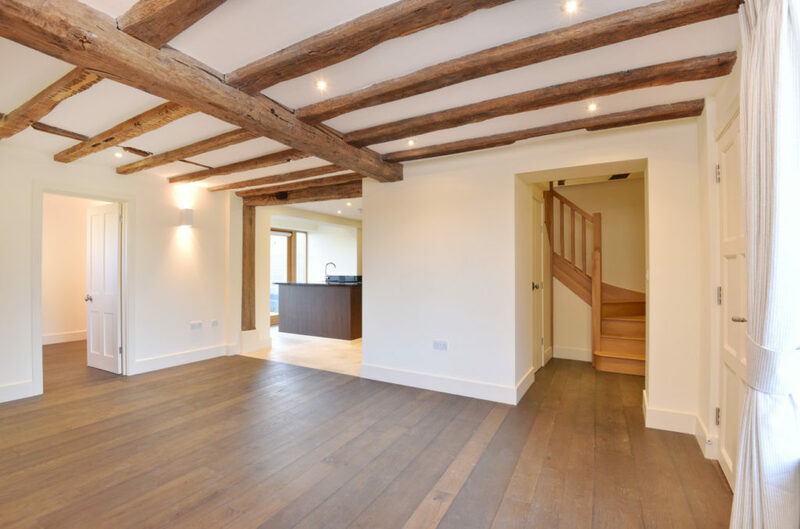 The cottage has been sympathetically refurbished to a very high standard. The property has a newly fitted kitchen including all new appliances as well as contemporary bathroom and shower room, fitted out with fine detail. 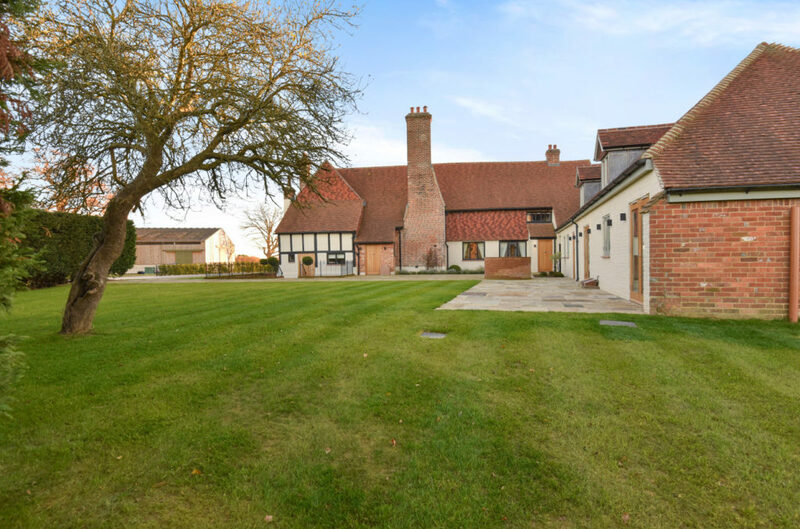 The property has been completely rewired and replumbed as well as having newly fitted double glazed steel windows and solid timber doors. Front Door leading to: Lobby with fitted coil matting. Living Area: 17′ x 10′ (5.18m x 3.05m) with beamed ceiling and dark wood flooring. Reception Room: 16’9 x 19’10” (5.11m x 3m) with beamed ceiling, double aspect and with dark wood flooring. 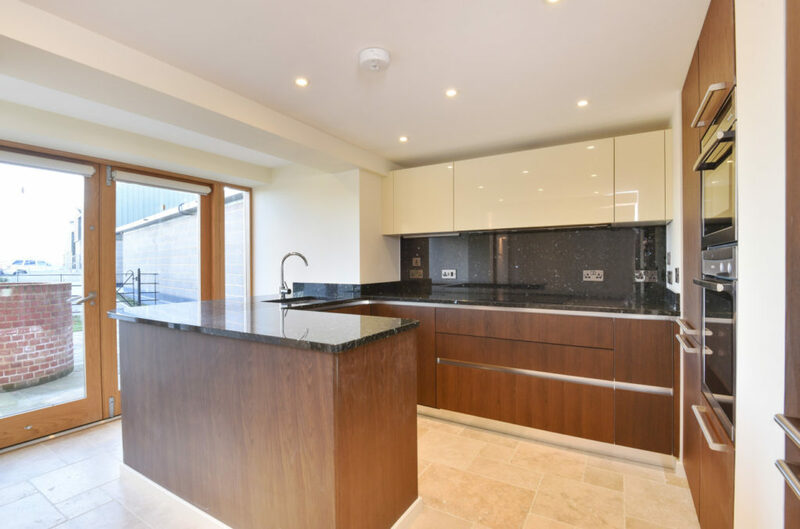 Kitchen: 22’7″ x 11′ (6.88m max x 3.35m into bay) with a wide range of contemporary fitted cupboards and drawers, granite worktops and splashback, built-in double oven, ceramic hob, extractor fan, dishwasher and fridge/freezer (all appliances are Neff). French doors leading out into rear garden. 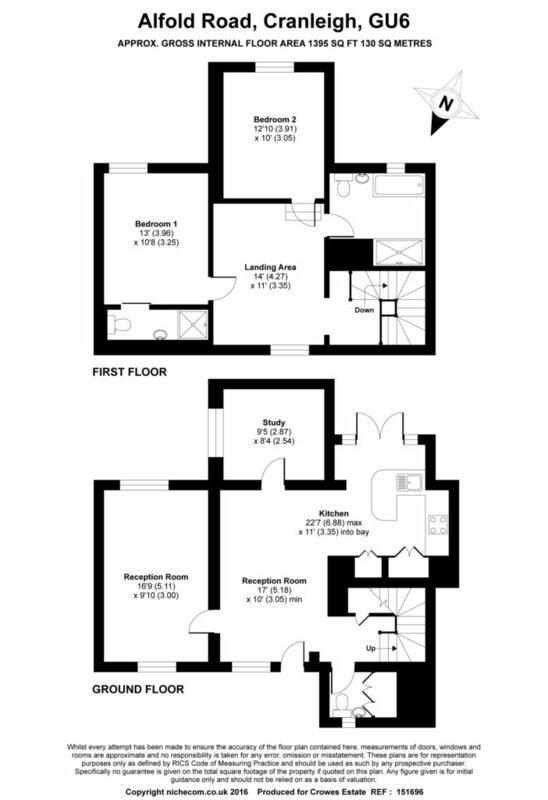 Study: 9’5″ x 8’4″ (2.87m x 2.54m) with beamed ceiling and dark wood flooring..
Utility Room/Cloakroom: within cupboard is washing machine, and tumble dryer. Hand-basin, wc and heated towel rail. Landing Area: 14′ x 11′ (4.27m x 3.35m) large area with faulted ceiling and original wood floor, numerous power sockets and space for wardrobes or desk. Bedroom 1: 13′ x 10’8″ (5.11m x 3m) with faulted beamed ceiling. 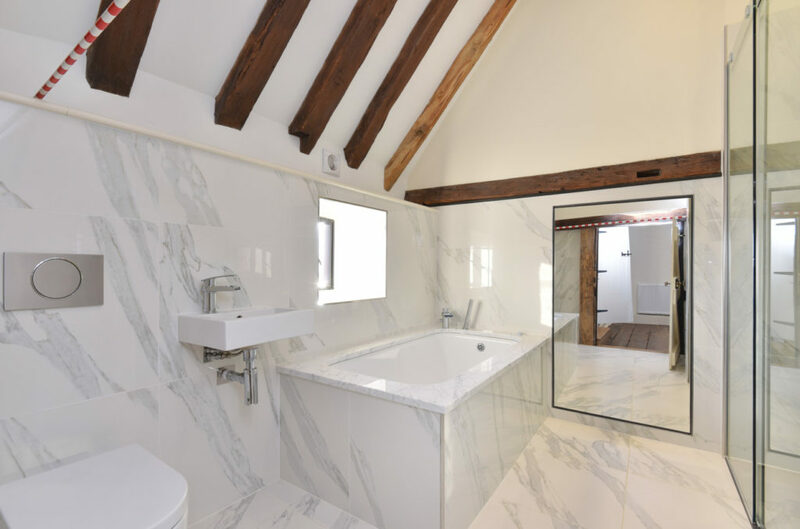 En-Suite Shower Room: walk-in shower with power shower, hand-basin, wc, mirror and heated towel rail. Bedroom 2: 12’10” x 10′ (3.01m x 3.05m) with faulted beamed ceiling. Bathroom: bath with separate shower attachment, large walk-in shower with power shower, jet spray and separate hand held shower attachment, hand-basin, wc, mirror and heated towel rail. Garden: communal front garden and wrought iron fencing enclosing rear garden. Parking: parking for two cars to rear of property.